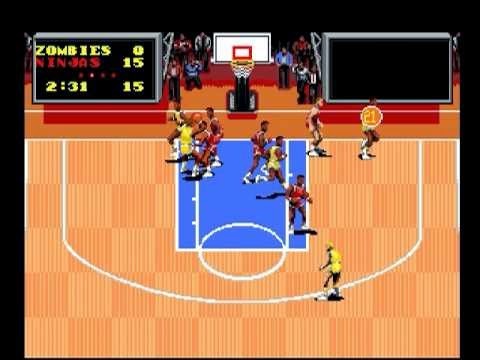 TV Sports Basketball is one of only two games of its type on the Turbografx-16, with the other being Takin' it to the Hoop (1989). Options include a League mode or an Exhibition which can be played with 1-2 players. The nice part apart the latter is that you can play as teammates as well as against each other. There are eight teams to choose from and they all have bizarre names such as Ninja, Snipers and Zombies! The more you play TV Sports Basketball you more you realise that it has very little in the way of presentation. There's no halftime show, one music track, no crowd noise and a boring interface with player stats. There's also no mid-court play; you only control your players at each end and centre court is displayed as a cut-scene where you select the type of play you want to run. The camera angle changes to a jarring side-view as well and it takes a second to readjust once the action restarts. The idea of calling your own plays is an excellent idea though as you can select things like post play, screens and clear-outs. It's just a shame that it's excruciatingly difficult to score and most offensive plays end up either as a brick or being rejected! Passing isn't precise and frequently I would hold left on the d-pad and my player would throw it to the right! Shooting is also an issue as it uses the same button as a pass. The mechanic relies on how long you hold the I button - press it quickly and you'll pass; hold it and you'll shoot. Again, this doesn't feel precise and there were many occasions that my player threw up a shot instead of passing. Fast breaks are pretty much non-existent as the CPU suddenly become world class sprinters during the mid-court transition screen! TV Sports Basketball is a boring game to play and fails to capture the essence of the sport. The presentation is pretty much non-existent and the gameplay is more frustrating than it is fun. Random trivia: Other games in the TV Sports series were released on the Turbografx-16 including Football (1990) and Hockey (1991).